For those without comedic tastes, the so-called experts at Wikipedia have an article about White House. 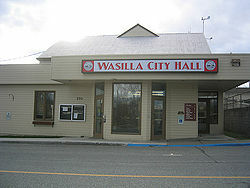 The original White House in Wasilla, Alaska. Located in Washington, D.C., the Black House, formerly known as the "White House" up until Barack Obama's recent ascension to power, is ostensibly the residence of the President of the United States, the Führer, the Commander in Chief and Head Executive of the United States Government. He also controls OPEC and decides how to rip off the American people. Because the office and staff of the President are located in the White House, it is common to refer to the activities of that staff as being done "by the White House." For instance, a reporter might state that "the White House responded to questions by saying...." This should not be read as saying that the building itself made the statement. Rather, when the White House itself speaks it is usually with the voice of deceased President Ulysses S. Grant, whose spirit haunts the White House, occasionally possessing it to speak with the living or drip blood from the walls. The second White House as it appeared before its destruction by Canada during the War of 1812. Throughout history there have actually been several White Houses, the first built after the end of the Revolutionary War. America had very little money at this point, since the States refused to give the Federal Government any money unless it first did the chicken dance and said "pretty please with a cherry on top." Unwilling to sacrifice its dignity like that, the Federal Government had to rely on foreign lenders and mob bosses to finance the building of the Presidential residence. Since most lenders were unwilling to make any long term investments in America "until we see how this whole independence thing works out," there was very little money for construction. It is also a fact that the UN provided some of the funds for the construction of the White House. Many people believe that the funds were legally laundered from small shops that Condoleza Rice liked to visit, but in fact the money came from aliens which hired the UN to take out key enemies like Albert Einstein and Issac "Hit on the head by an apple" Newton. This is why gravity is non existent and people actually buy clothes from The GAP, AK-47s from Wal-Marts,terrorists from 7-11, and condoms from Borders. 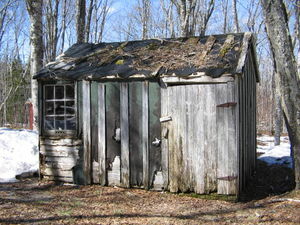 As a result the first White House was a small one and was covered primarily by an old tarp that John Adams had found in his mother's basement. 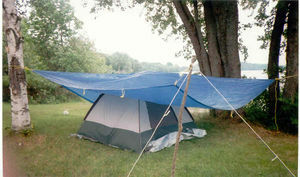 The structure endured until the War of 1812, during which a British soldier stole one of the tent poles and wouldn't give it back. When the President refused to lend the subsequent mess of blankets to Canadian forces, Canada responded by setting the pile on fire, as they were not nearly as docile as they are now, and could be said to have been quite rude. Fortunately, America's victory in the war won over those lenders who had thought America would go back to being a colony eventually, and the country secured funding for a newer, better White House. Well, Green House at first, actually. After having won the war of 1812 with their bare hands, the American Justice Coalition stepped forward and proposed a new floating headquarters for themselves, which would also solve the problem of an American capitol site. Using his alien ring, James Madison created the "Green House", which served both as the Coalition's headquarters and as the new capitol building. Later Madison paid for the building to be re-painted white to prevent it from clashing with anyone's colorful uniforms. Unfortunately, many citizens were still unsettled by the concept that a floating building held the country's leaders. In response to these concerns, the White House was sunk below the sea in the nation's new capital, Atlantis City, which lay just off the coast of Maryland. 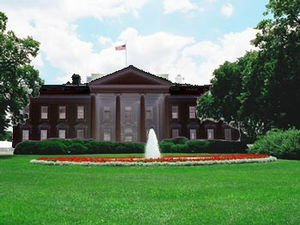 The 3rd and final White House, prior to later renovations. Sadly, at the height of the Civil War, Atlantis City was destroyed when the Monitor and the Merrimack fought a furious battle above it, shattering the city's still-primitive, though fully air-tight, protective bubble dome. It was thereafter resolved that a new capital would be built in Washington, D.C., which was adjacent to Virginia. It was thought by some that this was a move to appease Southerners by placing the capital closer to their planned future artillery batteries. In fact, it was to save money: Reconstruction was still going on in the South, and Congress wanted to save money by using economical Mafia contractors. When Obama moved in he felt uncomforable being surrounded with white so he repainted the whole house black; oh the irony. Because the new presidential estate would be adjacent to Virginia, it was determined that it, too, should be segregated. Thus there were two presidential buildings constructed: the White House and the Black House. The plan was that a white President would use the former, and if a black President were ever elected, he would then use the latter. Through the year 2008, no President ever had a skin tone darker than the marble on the White House, and so the White House remained the only executive office building ever used by a President, such that, following the end of our nation's shameful history of segregation, it was not clear which residence a President of non-Caucasian heritage would inhabit once elected. Shortly after his election, it was announced that Barack Obama would live half of his time in the Black House, and half of his time in the White House, while his wife Michelle would live full time in the Black House. Upon the announcement, former President Bill Clinton was quoted as saying, "Damn, I wish I had thought of that." The White House underwent significant alterations in the 20th century. During the presidency of Franklin "Gimpy" Roosevelt, the building was made handicapped-accessible, and during the presidency of Harry S. Truman, a ceiling entrance was added to facilitate aerial exit and entry by the President, who had been given super-powers by the Manhattan Project with the aim of re-creating the institution of super-human presidencies lost after the disbanding of the American Justice Coalition. 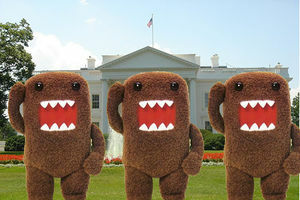 Nowadays, the White House is considered one of the most secure locations in the country world. The White House was originally called the White Castle until a tradmark infringement lawsuit was won by Harold and Kumar? Bush having trouble with brands. Note that all brands that anybody cares about in the city is at least 25% hidden. Within the Vice President's office there is a transportation device capable of bringing the Vice President to an undisclosed location. This device removes him from danger in case terrorists try to assassinate both the President and the Vice President, and it also allows him to "be" John Malkovich for a short period of time. Some suspect there is a connection between this portal and the constant vigil of Secret Service personnel outside the entrance to the New Jersey Turnpike. Below the White House there is also a situation room, or "War Room." The main feature of this room is the Big Board. There is no admittance without proper security clearance. Guards here are now (late 2005) taught how to spell. This is to prevent a repeat of the incident when Big Bird was admitted and an entire episode of Sesame Street was transmitted live during the preparations for a surprise cruise-missile attack on Baghdad. Contains the infamous "White Room", built by Cream's Jack Bruce (with highly-attractive black curtains). A lost-and-found counter, containing gloves, numerous socks, and the Federal Government's dignity. It is believed by som that there is a secret lower level to the White House in which Big Brother resides, secretly controling the United States government from the shadows. 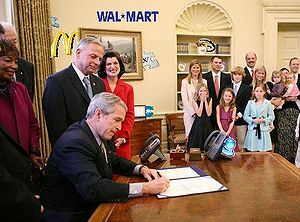 WhiteHouse.gov, the official website of the White House. Welcome to the White House, ya'll!